Tourism Australia statistics show that many overseas tourists, as well as Australians, are keen to learn more about Australia's first peoples. 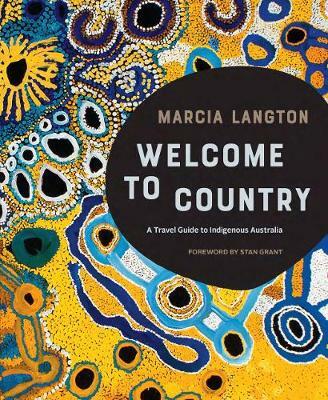 And while the Indigenous tourism industry continues to grow, no comprehensive travel guide is currently available.Marcia Langton's Welcome to Country is a completely new and inclusive guidebook to Indigenous Australia and the Torres Strait Islands. In its pages, respected elder and author Professor Marcia Langton answers questions such as what does `country' mean to Indigenous people. A detailed introduction covers such topics as Indigenous languages and customs, history, native title, art and dance, storytelling, and cultural awareness and etiquette for visitors. This is followed by a directory of Indigenous tourism experiences, organised into state and territory sections, covering galleries and festivals, communities that are open to visitors, tours and performances. This book is for everyone travelling around this fascinating country who wants to gain an insight into the culture that has thrived here for over 50,000 years, and enjoy tourism opportunities that will show you a different side of Australia - one that remains dynamic, and is filled with openness and diversity. This book will quickly become one of the most important travel guides to be published in recent times. Professor Marcia Langton AM PhD Macq U, BA (Hons) ANU, FASSA is one of Australia's most important voices for Indigenous Australia. She first became an Indigenous rights activist as a student at the University of Queensland, before spending time in Papua New Guinea, Japan and North America learning about those countries' peoples and cultures. On her return to Australia Marcia Langton graduated in Anthropology at ANU. Since then, she has worked with the Central Land Council, the Cape York Land Council, and for the 1989 Royal Commission into Aboriginal deaths in custody. Professor Langton has received many accolades, including an Order of Australia. She has held the Foundation Chair of Australian Indigenous Studies at The University of Melbourne since February 2000. As an anthropologist and geographer, she has made a significant contribution to government and non-government policy as well as to Indigenous studies. Professor Langton has written several books, both academic and popular, including First Australians (MUP, 2009), co-authored with Rachel Perkins, which was written n conjunction with an SDS documentary by the same name. She is also regularly asked to comment on issues related to Indigenous rights and art. In 2016 she was honoured as a University of Melbourne Redmond Barry Distinguished Professor. The following year, Professor Marcia Langton was appointed as the first Associate Provost at the University of Melbourne.